Ahead of this month's debut of the revamped Mac Pro desktop, which can drive up to three 4K displays, Apple is selling a new 4K "Ultra HD" 32-inch LED IGZO monitor from manufacturer Sharp in its online store. 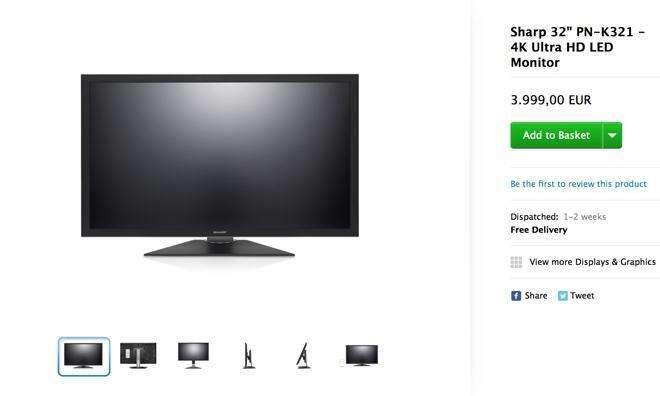 The Sharp PN-K321 4K monitor is currently available in various Apple online stores across Europe for 3,999 euros. It's also found in the U.K. store, but is not yet available in the U.S. The 32-inch IGZO display is advertised to have a 1.07-billion color palatte with 350 cd/m2 brightness and an 800-to-1 contrast ratio. It also sports built-in 2-watt-per-channel stereo sound, and supports landscape and portrait modes. The 4K resolution monitor packs in so many pixels that it's advertised to be able to view the content of four full-HD 1080p screens across a single display, all while reducing power with the use of IGZO technology. Its availability was first noted on Friday by IDG News Service. Availability of the 4K display through Apple comes as the company is preparing to launch a revamped cylindrical Mac Pro desktop this month. Apple has boasted that the computer, which will start at $2,999, will be capable of driving up to three 4K screens. 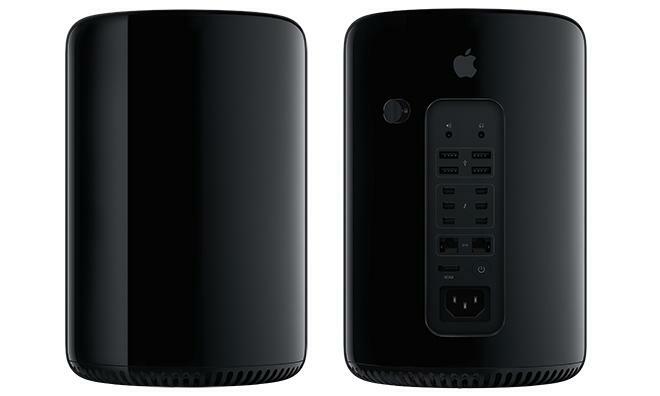 This week, German retailer Conrad temporarily began taking preorders for the Mac Pro, indicating to shoppers that the desktop will be available on Dec. 16. However, there has been no official confirmation from Apple, and the preorder page was subsequently pulled. The new Mac Pro will drive three 4K-resolution displays, but Apple does not yet offer a screen of that caliber resolution. The ability of the Mac Pro to drive three 4K displays has fueled speculation that Apple could update its own Thunderbolt Display to a Retina-caliber 4K resolution. Supply of the Thunderbolt Display has been tight throughout 2013, further driving hopes that an update could be forthcoming, though Apple has unsurprisingly not indicated any such information. Retina display-caliber wallpapers found in Apple's new OS X Mavericks operating system are 5,120-by-2,880 pixels, which is exactly twice that of the resolution found on the current Thunderbolt Display, as well as Apple's 27-inch iMac.